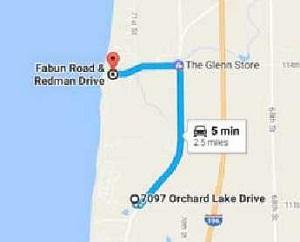 One of the closest public beach access points would be just outside of downtown Glenn. 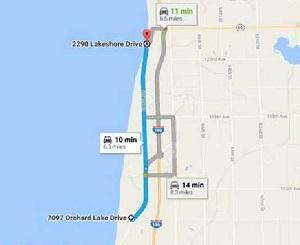 It's just under 3 miles and roughly a 5 minute drive. 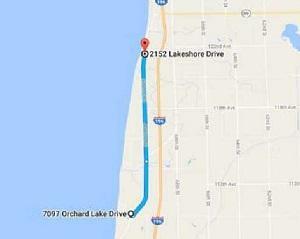 There is limited parking, a close and convenient beach to check out. 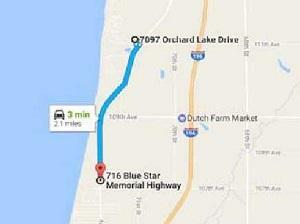 The Nature Preserve is located on the west side Blue Star Highway, just north of 107th Ave.
Just over a 5 1/2 mile drive you'll find West Side County Park, a nice beach, spectacular sunsets can be enjoyed by all using an ADA accessible ramp taking you right to the sandy beach of Lake Michigan at West Side Park. A small, beautiful beach, Pier Cove Park features a small creek that lets out into Lake Michigan, which is often warmer than the big lake. It’s perfect for small kids to splash in! Families can also find rocks and logs and make sculptures! This is the perfect pit stop to escape crowds; the only drawback: there are no bathrooms or changing rooms, so plan accordingly! 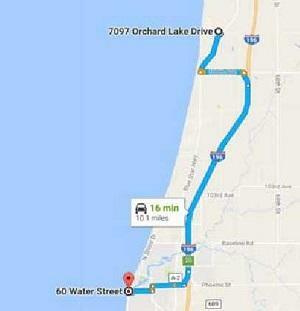 So, you can take less than a 20 minute drive to get to one of the BEST Beaches in the country. You get to the beach via a winding road past a plethora of cottages, tennis courts, and the sailing club, and through a forest (a challenge to bike this road!). You emerge to a gorgeous vista. Turn right, you’ll hit the showers/bathrooms/concession stand. Past that, you’ll see a gentle slope to the beach, with lots of parking. On the south end, however, is the magic – fewer parking spaces, a rickety wooden stair to descend, gorgeous grasses in the dune, and a quieter beach. There will be one or two sandbars to swim to. Rocky few feet toward the lakeshore, then clean sandy bottom. No lifeguard on the south end. Park Fees Apply, unless you’re headed there for a sunset swim – the toll booth closes around 9. Drive just past the entrance to the park, and you can climb Mt. Baldy and then cross the dunes to the beach – jump in for a refreshing cool-down! 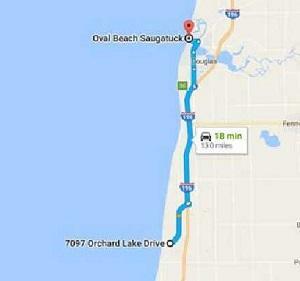 South Haven is fortunate to have seven public beaches or access sites. The North and South Beaches are the largest and most frequently used. Both have concession stands, restrooms, and parking areas. South Beach has children's playground equipment and our big red lighthouse. Visit this website for more area beach and fun things to see. Great website with lots of information…you must visit this site!